Why Do We Subsidize Obesity? Or rather, why does a salad cost more than a burger? Have you ever wondered why a McDouble at McDonald’s costs the same amount as an apple for four times the calories? In a country where one third of adults are obese, this question begs to be answered. It is all too easy to be overweight in America, thanks to the allocation of government food subsidies. 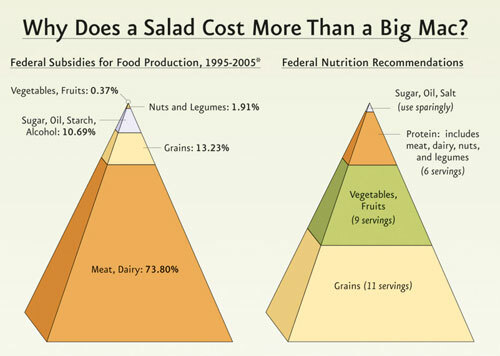 Despite the fact that the government releases info-graphics telling us to eat more vegetables and fewer foods high in fat and sugar, it chooses to use 73.80% of its federal subsidies to subsidize the production of meat and dairy and only 0.37% to subsidize vegetables and fruits. If we are to really eat according to the food pyramid, the subsidizes need to be highest for the foods we are supposed to be eating the most of. Why subsidize meat and dairy? It all goes back to the farm bills: the nine bills passed by Congress between 1965 and 2002. The Food and Agriculture Act of 1965 set the tone when it provided “commodity programs” for grains and wheat. Since then, the bills have been giving 75% of the subsidies to around 10% of the farmers, mostly those of feed crops (like corn and soy) that are used as sustenance for cattle and other livestock. By subsidizing these feed crops, the price of meat and dairy decreases, while that of vegetables just keeps getting higher. Lobbying is another cause behind the current allocation of subsidies. It is important to remember that food companies work not to keep us healthy but to provide profit to shareholders. Huge food corporations often spend vast amounts of money lobbying in hopes of persuading their congressmen to vote on food bills in their favor. This generally drops prices of the massive monoculture crops (like corn and soy), while leaving the unrepresented vegetable crops to face increasing prices. However, in recent years there has been a push for a healthier system. 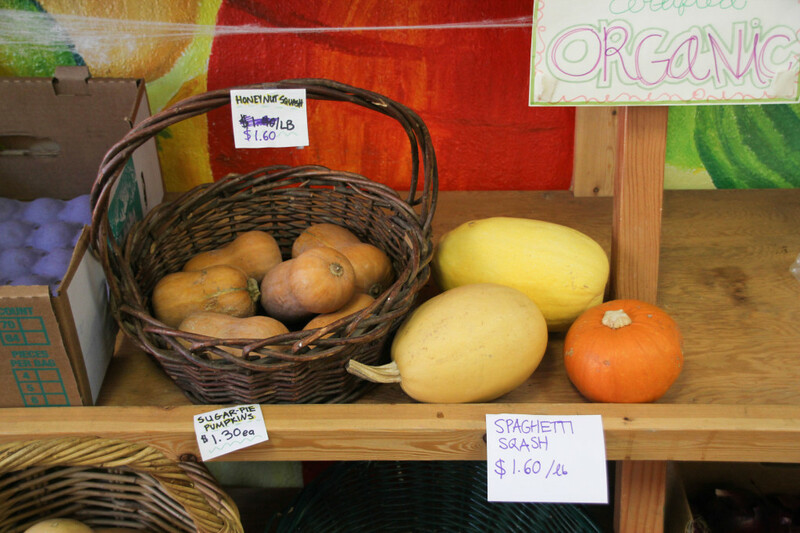 The most recent farm bills created the Supplemental Nutrition Assistance Program (SNAP) (to help low-income homes afford to eat more vegetables) and cut subsidies of unhealthy foods. Despite these steps towards a healthier future, our agricultural system is still set up in a way that allows less nutritious and more disease-related foods to be fairly inexpensive, while healthier crops are left without the money to make them affordable for the average family. 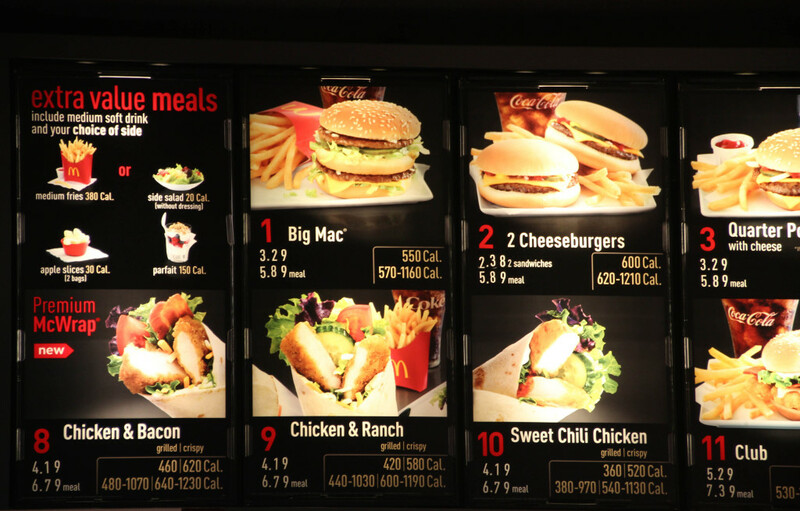 In a time when the population is high and jobs are few, it is no wonder why people choose to grab a high-calorie lunch off the dollar menu, instead of dropping upwards of $5 on a salad and fruit. However, it is possible and actually easy to eat nutritious meals for only a few dollars a day. Blogs like “Cheap Clean Eats” and cookbooks like “Good and Cheap” are great at teaching those on a budget how to eat well. In the meantime, becoming educated on how to eat nutritiously is the best step toward lowering obesity in America.